It is very satisfying when you can fill your kitchen with food at no cost and this has been one of our best years for fruit in the 17 years we have lived here. 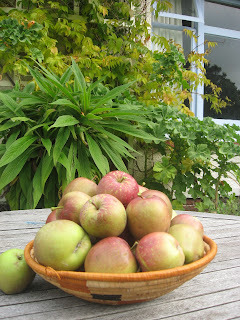 The apple trees are so laden with fruit their branches are almost touching the ground, the green house is full of the aromatic scent of ripe grapes and Vicky and I managed to fill two containers with blackberries from the side of a popular walking track. Vicky was concerned we were taking more than our share of the blackberries but despite being right beside the walking track there was no evidence of anyone else taking advantage of the bountiful supply. It was nice to have the fruit to ourselves but sad that others don't experience the prickly adventure of harvesting them and then the pleasure of eating homemade blackberry and apple pie. Daylight saving ended today and the Autumnal feeling outside was more pronounced due to the heavy cloud and crunching leaves underfoot, but inside our house the smell of grapes, blackberries and drying apples is a little like we have captured a bit of Summer to tide us over the Winter.